We get to choose our attitude, choose how your day will flow, or how your life will grow. Choice and attitude go hand in hand. It’s all up to us. Positive, negative or indifferent. We get to choose. 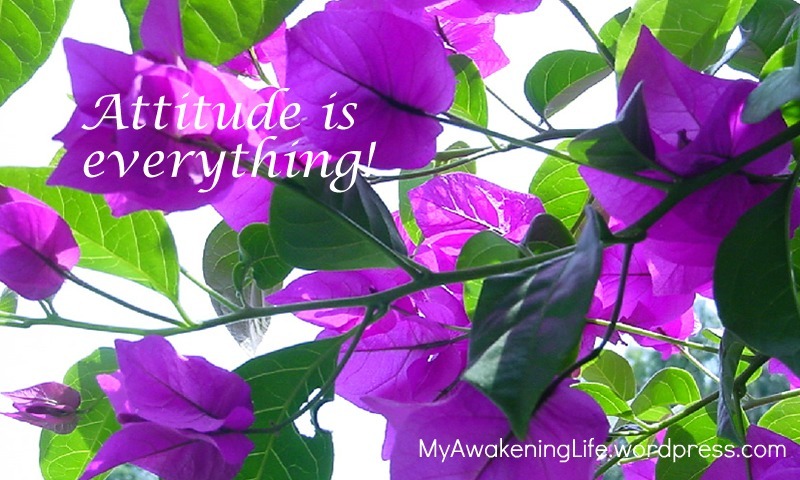 While we can’t always choose what happens to us, we can control our attitude towards what is. It’s not really so much as what happens as how our mind interprets the circumstance. About the photo: I just love this color combination of the shades of green, but mostly the purple, or maybe it’s lavender. What is that color called betwixt hues and shades? The paint department at any hardware store would yield many colorful names, I’m sure. This flower is Bougainvillea, a thorny, woody vine that seems to grow everywhere in warmer climates. Actually, I would say it is prolifically invasive as it throws it’s limbs over other plants, climbing to amazing heights. And no wonder, it’s one of those plants that is basically pest-free. I love picking the blooms, which last for a long time and I have also used their petals, (they dry nicely), to scatter color on my garden floor or add to potpourri. In reading about Bougainvillea, I learned that it can be used as a hanging plant. I think I am going to try that. Yes, Bougainvillea has an attitude all its own, a sort of take charge attitude. It lets nothing stand in its way, climbs to great heights, flowers almost continually and it isn’t bothered by pests. We should aspire to the attributes of Bougainvillea. I shot this photo from the ground looking upwards toward the sky. I like the way the petals seem almost transparent, exposing the veins in the petals. And speaking of Attitude, my daughter has a cat appropriately named Addy Tude!